Barack Obama, Middle East Peace, & AIPAC, or: I apparently don’t know how to give up. 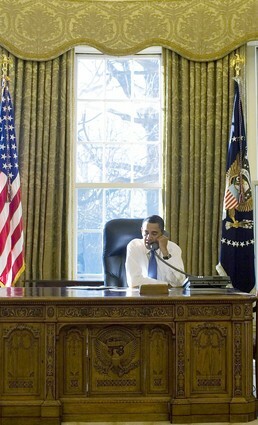 President Obama makes his first phone call from the Oval Office, to Palestinian President Mahmoud Abbas. Update: If you’re on Twitter, Facebook, Tumblr, Reddit, StumbleUpon or whatevs – please pass this on. The more, the better — there’s world-fixing that needs doing! I have a small task that I want you to undertake — it’s a small task, but it needs doing by many people. There are a lot of reasons to wish President Obama would show real leadership on the issue of the Israeli-Palestinian conflict, put forward his own peace plan, call the Israeli and Palestinian governments’ bluff, and take concrete steps toward of a durable resolution (click here to read J Street on why this is a good idea, and here to read Americans for Peace Now). There are plenty of reasons, however, to believe that he will do no such thing. Having started his Presidency with an intense focus on resolving the conflict (Obama’s first phone call from the Oval Office was to Palestinian President Mahmoud Abbas), he has proceeded to do virtually nothing. There’s been a little more pressure on settlements, and there was a kinda-sorta-not-really settlement freeze in place briefly. He and others in the Administration have said some good things. But that’s it. Not a good sign. George Mitchell, named Middle East envoy by Obama in the Administration’s first days, was entirely cobbled, and then side-lined by the re-injection of old MidEast hand Dennis Ross into the fray. Mitchell threw up his hands and resigned. Not a good sign. Every single Administration before Obama’s (other than Eisenhower!) caved and followed the Israeli lead. That’s quite a tradition, and it’s not a good sign. President Obama has confirmed that he will be speaking at the AIPAC Conference on Sunday, and the AP reports that spokesman Jay Carney has said he “will not deliver a major policy speech, but will instead talk about the deep bond between the US and Israel.” Not even remotely a good sign. The President is also planning to speak first (on Thursday) to the nation and the world about the events of the Arab Spring — and after yesterday’s Nakba Day events (for a good summary, read this piece by al-Jazeera, or this piece in Haaretz, but suffice it to say: It was bad), there may be some busy re-writing to address the heightened sense of urgency surrounding Palestinian rights. Maybe, maybe not. In the circles I run in, all of the above not-good signs are considered pretty good indicators that we should not be holding our breath. But M.J. Rosenberg, a man who has watched the scene for a minute or two, and knows a thing or two, thinks that Obama may be looking for help. From the likes of us. In 2007, the day after Obama declared his candidacy for president, I met with him in his office (I was then working for Israel Policy Forum). Obama listened carefully while I explained why it was critical that he be an “honest broker” on Israel-Palestinian issues. Nothing I said, including my opinions of AIPAC’s influence, would surprise anyone who reads my columns. My bottom line was that the occupation was terrible for the United States, for Israel and, most of all, for the Palestinians and that he should understand that the status quo lobbyists who defend everything Israel does are not representative of the Jewish community or anyone else. I didn’t understand; I was sitting right next to him. So maybe, just maybe, the President wants us to shout and holler about, what appears to be, a sellout to AIPAC. After all, he is making no attempt to cover up what he’s doing or why he’s doing it. He only hears one voice. Maybe Obama’s latest actions are a cry for help. Yes, it’s just a theory. But it is infinitely better than believing that President Obama actually believes that AIPAC’s status quo is in America’s interest. It just is not possible that this President could believe that. It’s time to raise our voices so Obama can hear us, whether he still wants us to or not. If you want to see the President of the United States take a stand for a just Israeli-Palestinian peace and (not for nothing) long-stated American policy goals — let him know. Make a phone call – the White House phone number is: 202-456-1111 (And if you’re Jewish or Israeli-American, make sure you mention it). Send an email – the White House contact page is here: http://www.whitehouse.gov/contact (you’ll find a sample email after the jump). And yes — I want you to do both. But more importantly, it’s possible that the President does, too. To quote Auden: “All I have is a voice/to undo the folded lie.” It’s time to use your voice. I’m an American Jew/Israeli-American Jew/American for whom Israel’s future and well-being are very important. As change sweeps across the Middle East, I deeply and sincerely hope that you are planning on addressing the ongoing Israeli-Palestinian conflict. I honestly believe that the only way that you can serve American, Israeli, and Palestinian interests is to make a real break with the past, and take leadership in presenting an American peace plan. Not only do the Israeli and Palestinian peoples deserve an end to bloodshed and real security, but I think that American interests throughout the Middle East demand that the US act to mediate a final peace agreement. Please use the opportunity of your upcoming speech and your appearance before AIPAC to do what’s best for Israelis, Palestinians, and Americans. Dear Israel: Your house is on fire, & you’re worried about the pilot light. Good stuff: You are not really John! Its a good and right step. Thanks for your passion and activism. I’ve emailed; I’ll call tomorrow. I admire the Jews who are standing up and making themselves heard. You have my respect and my support. My belief is it will be individual Jews within Israel and the diaspora who will ultimately force Israel’s hand. It will not be AIPAC and the US Congress. I am less than charitable towards Israel on my blog at http://sajepress.com but there are things that must be said. As a Unitarian, I’m convinced of the need for peace across the globe… but any solution I may have for the Middle East with regards to Israel and Palestine is at the moment a hopeless wish. I see too much hatred and violence in both sides of the struggle, and an unwillingness by either party to be the first to step back in any way. It’s as though both sides are terrified of the idea: that whoever is the first to put their weapons down somehow has to be the “loser” in this war. The need to win even at the cost of bloodshed seems too great. And what makes the problem worse: both sides have a legitimate fear that if they step back from their militant position that things will get worse for them (with Jews, the whole sad history from 70 AD to the Holocaust: with Palestinians, centuries of occupation under Ottoman, Egyptian, Crusader and European, and now Israeli rule). I can’t entirely blame either the Israelis or Palestinians for being as defensive as they are… but at the same time I can’t, no one should, condone the level of violence they’re both committing against each other and on anyone else who gets dragged into the struggle. Here, the enemy is Fear. And how do you fight Fear…? It really is time. Thanks for laying this out so clearly. I just posted my comment through the whitehouse form, and I called the comment line but it is closed for today.